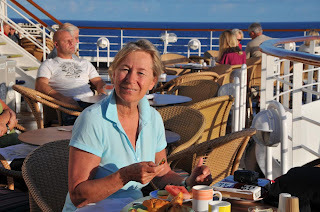 Woke up at six thirty this morning (actually seven thirty but we are turning our clocks back an hour each night to keep up with the time change) and went up to the promenade deck to watch a gorgeous sunrise and enjoy a cup of (not very good but at least hot) coffee. I was surprised at how many people were up and about. One couple was in the outdoor pool doing aquatics, a few staff were in the Lido pool doing lengths, and some early bird types were already tucking in to breakfast. I brought espresso from the Explorer Café back to the room as a wake up for Bob, and then breakfast was delivered. I only managed two miles on the treadmill because I had to shower and meet the executive chef Thomas Schumann for a tour of the galley kitchens. They bake thier own bread daily and most things are made fresh on board. They are immaculate, and they are run with military precision. Then we headed for the Lido pool, - it’s 82 degrees today - and managed to grab two deck chairs, where we dozed in the sun and read our books . I’ve finished The Angel’s Game, not very good but I felt I had to finish it, and have started another Ian Rankin. Bob is deep into David McCullough’s 1776. 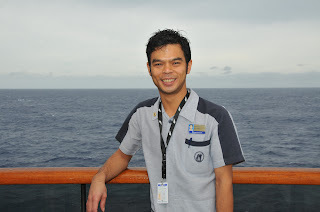 Our cabin steward, Miftah, is thirty years old and comes from west Java. He has helped his younger brother get a job with the company and he will be joining the same ship as his older brother in Fort Lauderdale. Miftah is a very likeable young man with perfect manners and a good sense of humour. I think he l0ooks live an Indonesian version of Brad Pitt. Yesterday one of the passengers died unexpectedly on the ship. He was 75, and was apparently a very large man. It is rare that someone doesn’t die on a crossing - the average age of passengers is older for long voyages - and they have refrigerated cubicles for just such an occurrence. They keep the flowers there when it isn’t in use. John Duffy used to say that a ship was in reality just a floating city, and anything that could happen on land could happen here - crime, death, insanity, love. So death is something for which they are prepared. But I was wondering how they would get that man’s body down the hall. He would be dead weight (pardon!) and would be very tricky to manoeuvre through the narrow cabin door and into the hallway. Maybe they would put him in a wheelchair and take him out that way. I feel so sorry for his wife who must now continue the voyage, without the solace of friends and family, until she reaches Florida on Wednesday.